In March 2013, Sir Muir Gray stood up at the Cochrane UK & Ireland Anniversary Symposium Gala Dinner and asked everyone under the age of 40 to stand up and be toasted by everyone in the room over 40 years. He sought to recognise not only future generations of Cochrane contributors but also the future stakeholders for evidence-based health care, in general, the health professionals, policymakers and consumers. This toast to the younger generations represents one of the core aims of the UK Cochrane Centre (UKCC), to engage with all our audience (our stakeholders) and increase the use and dissemination of evidence-based health care. Students 4 Best Evidence (S4BE) is part of that aim. S4BE works by bringing together people and resources (S4BE.org). 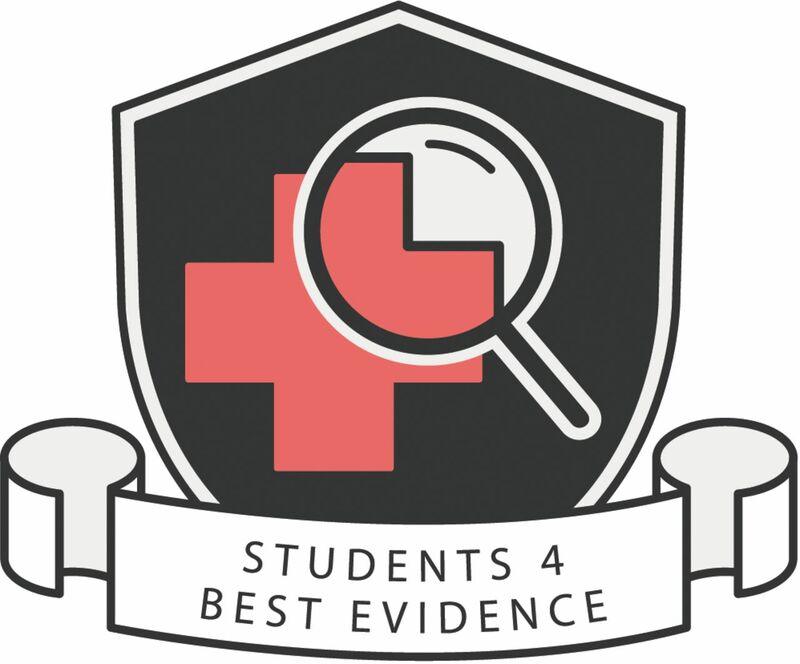 The S4BE web-based community of students seeks to identify evidence-based health care resources, which are then categorised and commented on, pointing out those of most interest and usefulness. The students also promote, discuss and critique evidence-based health care by blogging about the latest evidence on a particular health topic (eg, a recently published systematic review or the importance of economic evaluations in health care) or by explaining evidence-based concepts such as medical statistics, critical appraisal tools or evidence databases. All the items posted in S4BE website are peer reviewed postpublication by fellow students, or any interested reader, using the responsive comments section. The comments section under each blog, not only allows any reader to respond and discuss the contents, but it also pulls in tweets and Facebook comments. All comments are screened first before being published live on the website. This feature has proved to be a useful tool to extend blog impact and increase engagement among students. One particular example is Tim Hicks’ blog tutorial on ORs and CIs, which has prompted a lot of further discussion. S4BE was conceived in 2012. The S4BE project was started with support from the UKCC (part of the Cochrane Collaboration), which saw it as an important way of promoting evidence-based decision-making and systematic reviews in general to students of all types.i We recognised students as a key group of stakeholders and wanted to reach them to improve their learning, understanding and use of evidence-based resources. That year Martin Burton (Director of the UKCC), Norah Essali (a medical student, previously studying at the University of Kalamoon, Syria and now studying at Texila American University, USA) and three other students from the University of Oxford (Sean Noronha, Jessica Jameson and Govind Oliver) embarked on the project that was to become S4BE. A group on Facebook was soon set up that recruited more than 250 members and we realised that student knowledge of evidence-based medicine varied enormously. It was however something that many were interested in. To promote social interaction and participation, S4BE commissioned Minervation, an evidence-based web design company who produced sites such as The Mental Elf,3 to set up a responsive and visually engaging website that stood out from the usual style of the existing health websites. The formal launch also gave us an opportunity to increase awareness of evidence-based health care in the student community, to attract organisations, groups and societies to join S4BE as partners and to disseminate the student contributor's work through their own networks and contacts. We now have 28 partner organisations, including Testing Treatments interactive English, Radboud University Medical Center (Nijmegen, the Netherlands) and the charity—Sense about Science. But why is all of this important to the readership of EBMH? Mental health has become a priority worldwide both from the research point of view and also for clinical practice. Despite an exponential rise in the number of research studies published, progress in treating mental illness has come to a halt, also because many scientists focused solely on their own area of expertise, rather than sharing data and collaborating with others.6 It is time to increase research collaboration and gather resources and knowledge to improve patient outcomes. With the EBMH editorial board's new focus on the younger generations of health professionals, we all need to work together to improve student knowledge; not only of evidence-based concepts but also of how to put those concepts into practice. This is where S4BE can help and where S4BE and EBMH can work together, sharing the same vision. Understanding and remembering evidence-based concepts can be tricky, putting them into practice even more so. S4BE is a resource and a support community that any student (or newly qualified health professional) interested in evidence-based health care can get involved with. It does not matter whether the students are on their first clinical placement, revising for an exam or wanting to catch up on the latest evidence. The more the number of people who collaborate in identifying resources and providing support, the more likely it is that student knowledge will increase and with it patients’ experience through evidence-based practice. If you would like to know more about getting involved with S4BE (S4BE.org), contact Holly Millward at general@students4bestevidence.net, @Students4BE on Twitter or through our Facebook page (/Students4BE) or Google+ page.
. ‘Trust me, I'm a professor!’ Evidence, medical schools & students. Scientific American [Internet]. 2013 September 23. http://blogs.scientificamerican.com/absolutely-maybe/2013/09/23/trust-me-im-a-professor-evidence-medical-schools-students/ (accessed 15 May 2014).
. 1931-1971: a critical review, with particular reference to the medical profession. In: medicines for the year 2000. London: Office of Health Economics, 1979:1–11.
. Advancing evidence-based practice to improve patient care. Evid Based Mental Health 2014;17:1–2. ↵i The Cochrane Collaboration is an independent, global organisation that produces and disseminates the latest evidence in health care through the production of systematic reviews. The Collaboration was born in 1993 in response to a challenge set by the physician and epidemiologist Archie Cochrane. In 1979, Cochrane said “It is surely a great criticism of our profession that we have not organised a critical summary, by specialty or subspecialty, adapted periodically, of all relevant randomised controlled trials.”2 In 1992, the UKCC was established and the Collaboration was ‘born’ a year later. Funded by the UK National Institute of Health Research (NIHR) the UKCC helps to maintain and improve the quality and usefulness of Cochrane reviews through the provision of learning, development, support and dissemination to UK-based and Ireland-based Cochrane contributors and a wider community of health consumers.